For as many as fifteen debts, this calculator can help you see just how much you’re paying in combined interest on your credit card balances. In the process, you may decide that it’s best to move one debt (or more) to another card with a better interest rate. In the fields provided, enter principal balances, annual interest rates, and the most recent interest charges for up to fifteen individual debts. Click on “Calculate Results,” and you’ll get a breakdown of your monthly debt-related expenses, including the total of your current principal balances, total interest costs per month, and the average interest rate you’re paying across all debts. Enter the description in column #1, the principal owed in column #2 and the interest rate in column #3. Column #4 and the total blended rate will be automatically calculated each time you edit any of the other values. Accumulating debt is pretty easy, especially if you're the type who doesn't like to pay attention to what you spend. And when you factor in the pressure to consume that dominates our society, it's easy to see how so many adults end up living beyond their means and owing massive amounts of money to creditors. Plus, it's not like it's particularly difficult to get credit cards - from the time you become a legal adult, you'll find yourself inundated with offers for lines of credit that you can scarcely afford. And even if you are careful with your credit initially, you may soon find yourself dealing with an auto loan, student loans, and/or a mortgage payment on top of your credit card debt. Ideally, your salary will increase over time to cover these costs, but even so, it's all too easy to get in over your head. The good news is that there are ways to pay off what you owe without going so far as having to declare bankruptcy. And the process begins with prioritizing which bills to pay off first. There are a number of ways you can go about prioritizing your financial obligations. One of the first things you'll want to look at is how much money you owe to each lender on your list. While it might be tempting to pay off the largest sum first, you're probably better off attacking the smaller numbers for a couple of reasons. For one thing, removing bills from your monthly slate will reduce the number of payments you have to keep track of. This will make your life easier and help to ensure fewer missed payments that could lead to further penalties. In addition, paying things off reinforces your vow to reduce your financial obligations. When it comes to paying off lenders and creditors, it could take you years to pay off the largest bills (for a car, a house, student loans, and so on), and often the largest sums come with the lowest interest rates. So paying off smaller bills first is more desirable on every front. When it comes to financial obligations, the real concern is not the amount of money you spent on credit, but the amount of interest accrued on the initial "loan." And don't forget that spending on credit is no different from any other type of loan, except that the interest rates are often significantly higher than standard bank loans. In order to pay down the money you owe most efficiently and save the most in the process, you should start by creating a priority list that puts the highest interest rates at the top. Of course, this means you need to know how much interest you're paying for each line of credit, and a surprising number of people have no idea. In most cases, the rate is listed on your monthly bill, but you can also call lenders to find out exactly what interest rate you're paying. You might also want to ask how much the rate jumps if you miss a payment or fail to pay the minimum each month. Often, the rate can double (or more) in such cases. If you have credit cards with particularly high rates, you may want to try to consolidate the money you owe to the card with the lowest interest rate. This will not only reduce the number of bills you receive each month, but it could actually lower monthly payments and decrease the amount you end up paying towards interest in the long run. The rate at which interest accrues is an important factor to consider - perhaps more important than the interest rate. 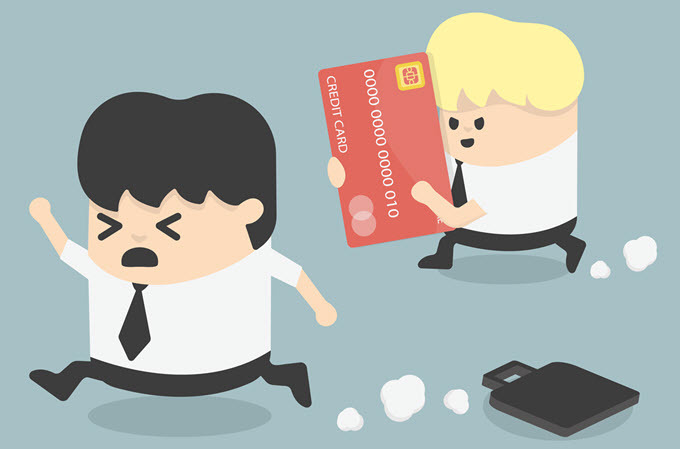 Thanks to compounding interest, credit cards tend to be the worst offenders. This means that each month you are not only charged interest on the amount you borrowed, but also on the interest accrued the month before. It is added to the principle and you are charged interest on your interest. And some companies even compound the interest twice each month. It sounds crazy, but that's how it works. So you almost certainly want to focus on paying down your credit cards first, rather than standard loans, which calculate interest payments based on the initial principle and then spread them out over the life of the loan. Your credit report delivers more than just your current credit score. It also shows what you owe and gives you insight into what you can do to improve your rating. While your main goal may not be to improve your credit score, paying off financial obligations will almost certainly result in a better credit rating. But the important thing is that your credit report can show you black marks like missed payments and bills that have gone into collections. This can give you a roadmap to prioritizing payments. Obviously, you'll want to pay off any bills that have gone into collections first. After all, these are the most likely to cause you legal trouble (and increased expense). There is a silver lining here, as well. Lenders may be willing to work with you to reduce outstanding debts once they've gone into collections. By forgiving some amount of what is owed and setting up a payment plan that works for you, they can manage to recoup at least a portion of their costs. This could definitely help you pay off your highest-priority bills faster and drastically improve your credit score in the process. Most of us never receive any kind of financial education, so it's really no wonder that we find ourselves in hot water when it comes to managing our finances. But there are professionals who can help get you back on track. If you're really stuck when it comes to prioritizing your financial obligations, a financial planner can help you formulate an efficient and effective plan for repayment. And going a step further, a financial planner will teach you how to manage your money more wisely in the future.